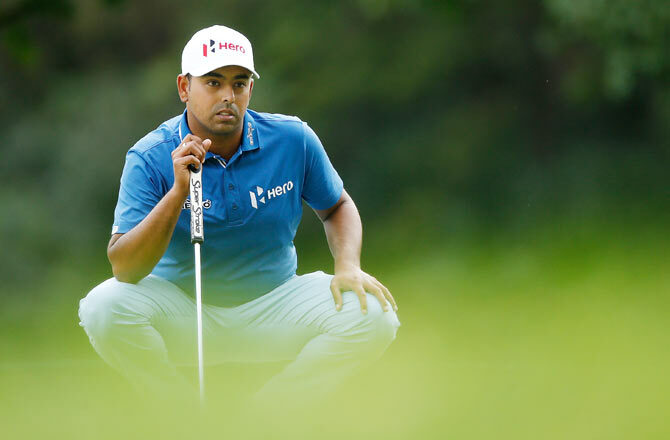 Anirban Lahiri landed a crucial eagle on the back nine to make a cut for the weekend at the $7.3 million AT&T Byron Nelson on the PGA Tour. Lahiri carded a superb five-under 65 with four birdies and an eagle to move to three-under for the tournament and was placed tied 59th as he moved 64 places up from the first round. The 28-year-old Indian, whose only top-10 this season has been a second place on European and Asian Tour's Hero Indian Open at home, started down the barrel after carding two-over 72 in the first round, which he completed on Friday morning. Lahiri was two-over through 16 holes on weather-hit first day and came back to complete his first round on Friday. He parred both holes, but had a three-putt on the 18th. t the top, Ben Crane shot a seven-under 63 on Friday at the AT&T Byron Nelson to take the second-round lead at 12-under 128. He was one stroke ahead of a quartet of players that included Jordan Spieth, playing only his second tournament since squandering a five-stroke lead on the back nine when trying to win his second consecutive Masters. "It was disappointing to come out and finish weak with a 3 putt this (Friday) morning. With the conditions perfect for scoring I really put myself way out of position," said Lahiri. However, he gathered himself in time. "Coming out for the second round, I was just trying to stay positive and get some semblance of momentum which was absent in the first 18. I got off to a good start (from the 10th) but then misjudged the yardage on 17 to drop back again." He was two-under at the turn after three birdies and a bogey and had moved to even par for the tournament, but that was still going to be insufficient to make the cut. "Going into the last nine I set myself a target to get to 3 under. I missed a lot of make-able birdies on 18, first and third then birdied fourth and made a clutch 15 odd footer for eagle on seventh. "I could have made one more birdie on 8 or 9 but the putts just shaved the hole. I am happy to be playing the weekend after looking down the barrel earlier this morning. Hopefully I can carry this form through to Sunday," he said. Playing into the wind on the seventh, Lahiri smashed a driver and 3-wood to get within 14 feet for an eagle putt, which he drained to his relief. Spieth was alone in the lead for a bit while playing in the morning, but after finishing his round of 65 was tied at the top with Brooks Koepka (64) and Bud Cauley (65). First-round co-leader Sergio Garcia also joined them after a 66 later in the day. The last time Crane had led a tournament was going wire-to-wire to win at Memphis two years ago, the last of his five PGA TOUR victories and his last top-10 finish. This is his 48th tournament since. After the Masters last month, Spieth missed the cut last week at THE PLAYERS Championship. Spieth has hit 33 of 36 greens so far, and the only one he missed yesterday was No. 9, his final hole of the day. He pitched to 11 feet and saved par. D A Points had nine birdies and a bogey through 13 holes in his second round, then parred the last five holes to finish a round of 62, the best round of the day and nine strokes better than his first round. Defending champion Steven Bowditch shot 70 on Friday and just made the cut at 2-under 138.